Travelling by train to Toronto is usually very convenient and restful experience. Being the major financial and cultural centre of Canada, Toronto boasts very well organised and frequent train links from different parts of the country. From US, you can travel by a train from New York to Toronto. No matter from where you take a train to Toronto, you will be charmed by some of the most beautiful scenes on the journey. And in Toronto, you will be greeted at equally magnificent and historic Union Station located in the heart of the city. VIA rail is Canada's premium intercity and long distance rail travel carrier. Union Station serves as VIA rail's major hub in eastern Canada and connects a number of their routes. Amtrak and Ontario Northlander also run their trains to Toronto. Let us check out the various train operators and their popular routes operated out of Union Station. VIA rail's ultramodern intercity trains connect Toronto to Windsor, Sarnia, London in south-west and Quebec, Montreal, Ottawa in north-east. You will find regular trains to and from Toronto on Corridor line, which has the highest frequency of passenger trains in Canada and also a key source of revenue for VIA rail. VIA rail offers Economy class and Business class tickets on Corridor line. If you book your tickets well in advance, you get the largest discount on trains to Toronto. So take a VIA train to Toronto, forget about the jam-packed traffic and severe weather. Enjoy the great relaxing ambience and caring service. VIA rail's flagship luxury line, The Canadian, operates on transcontinental route and links Toronto and Vancouver. It is considered as one of the greatest train journey on the planet and provides an experience of lifetime. VIA rail runs train three times a week throughout the year on the route and journey takes approximately four days. While it is considered one of the most expensive rail trips in North America and many times even more expensive than flying to Toronto from Vancouver, it is the best way to see the Canadian countryside, passing through Winnipeg, Saskatoon, Edmonton, Jasper and Kamloops. You can choose the comfortable vibes of budget travel in Economy class or enjoy the luxury of a cosy bed, a gourmet dining and exclusive access to stylish lounges in Sleeper Touring class. All visitors can enjoy the 'Skyline' car with coffee shop, lounge and panoramic dome, which provides stunning views of the scenery. Sleeper Touring class travellers can take advantage of the 'Park' car and enjoy the 360 degree views in the upper observation deck. The fare on this route varies by time of year, higher in July and August, and lower at other times. If you are in the USA, it is possible to take a train to Toronto on the Maple Leaf route that is co-operated by VIA Rail and Amtrak, America's passenger rail line. In fact, you can catch a daily train to Toronto from New York City at Penn Station and it also stops at Albany, Buffalo and Niagara Falls besides a few other stations. While New York city to Toronto might be a popular train route, it is a bit expensive and lengthy journey due to the extended stops at Customs and Immigration checkpoints at the border. For this reason, there are disadvantages involved with train travel to Toronto from New York city, including the 12.5 hours it takes, but for those who are looking for beautiful scenery, it is hard to beat the Maple Leaf route that includes Niagara Falls. For one-way or round trips originating in New York, you can check the fares, schedule and buy your ticket online at www.amtrak.com. For more information call at 1-800-872-7245. For one-way or return journeys starting in Toronto, you can purchase tickets online at www.viarail.ca. For more information call toll-free 1-888 842-7245. Book your tickets well in advance to get cheap fare. Also, checkout the deals section at www.amtrak.com before making the purchase. If you are taking a train to Toronto from New York, please don't forget to bring all the necessary documents required at the Immigration checkpoint. How to Buy VIA Rail Toronto Tickets and Get Cheap Fare? The best and cheapest way is to buy tickets directly from VIA rail's website www.viarail.ca. There are also several ticket counters at the Union Station from where you can book your tickets. VIA rail offers various deals and discounts throughout the year. Buying your VIA rail tickets in advance gives you major savings. So book your tickets beforehand to avail the special and supersaver fares. There are other discounts available for youth (18 to25), full-time students (12+), travelers over 60 and children (2 to 11). VIA rail offers Express deals where you can get up to 75% off on last-minute departures, which can be the most affordable for those travelers that are more impulsive, flexible and spontaneous. You can purchase a Canrailpass for 7 trips in Economy class during a 10-day period and enjoy the best discounts. During summer, VIA Rail offers special fare of $10 for children train trips anywhere in Canada, making a train the perfect way to spend a family vacation. The Ontario Northland train offers connection between Cochrane in Northern Ontario and Toronto, six days a week. The train stops at Gravenhurst, Huntsville, North Bay, Cobalt and other small stations en route. The train runs on a single line that might have some delays because of periods where freight trains need to pass. You can see beautiful scenery of the scarcely populated remote area of the northern Ontario. The Ontario Northland provides comfortable and affordable train to Toronto. You can purchase Northland passenger train ticket at any Ontario Northland station and at Ontario Northland agencies. You may also buy the ticket on phone by contacting Ontario Northland at 1-800-461-8558. For more information visit www.ontarionorthland.ca. 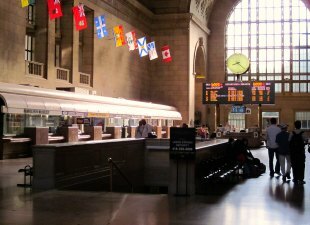 Union Station is major intercity train station and serves as hub for train travel in Toronto, located on Front Street between Bay and York Streets, in the core of the downtown. Union Station is considered as one of the most impressive train stations in North America. It's an amazing masterpiece of architecture, especially the interior of the enormous 'Great Hall' of the building, making it a great tourist spot in its own right. From here you can take Go Transit which can be accessed from the underground GO Transit concourse, as is the Union Station Bus Terminal. The station is also connected to Toronto Transit Commission (TTC) subway and streetcar system through adjacent TTC station. Travelling by train to Toronto is a little bit expensive and consumes more time depending on where you are coming from. However, you will enjoy many inimitable and spectacular scenes while travelling by train that you might not see any other way. For this reason, taking a train to Toronto might be the best way to enjoy all the wonderful things that Toronto has to offer for the visitors.